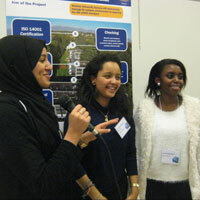 Geneva students Nour Lashuel, Etsehiwot Negash and Joy Warugi presented in Paris. While governments met in Paris this December to tackle climate change at COP21, students from Webster University's Geneva campus and 20 other top universities were meeting across town to address the same issues with innovative local plans. The Global University Climate Forum was organized by the International Alliance of Research Universities (IARU), Yale University, Sorbonne Universities, and the International Sustainability Campus Network (ISCN) to create a platform for student engagement in climate issues and to exchange ideas on how to make their campuses more environmentally sustainable. Webster Geneva Scholars Program students Etsehiwot Negash, Nour Lashuel and Joy Warugi, advised by Peter Carson, adjunct faculty from the Webster Geneva Sustainability program, answered the Forum’s Call for Proposals with “GWEMS” (Geneva Webster Environmental Management System). Their project aims to improve Webster Geneva’s environmental sustainability by following the International Standard Organization’s (ISO) environmental standard. “Our campus is in a wooded area on the watershed that feeds Lake Geneva and the Rhône. GWEMS will allow us to manage our impact and protect this natural setting we enjoy,” said Carson. The Webster team had the opportunity to present its ideas in a poster session, receiving feedback from other teams and experts from University of Massachusetts, University of California at Berkley and others. After the event, the team must report to the forum monthly for one year on their progress of the project. This initiative will not only help the Webster environment, but also raise campus awareness on the importance of environmental sustainability and its role in the lives of students. "This has been a great experience to be part of a bigger community and participate in the global discourse on issues of climate which is of great significance to the community of nations," Negash said.